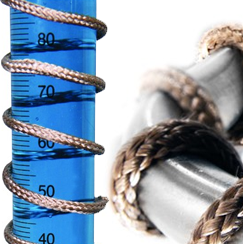 Heating tape is an easy-to-use, ideal for a wide range of pipe heating applications and inexpensive. This article will provide simple installation tips to improve your heating tape product life, application performance, and most importantly, your safety. Prepare surface to be heated: Wipe the surface making sure there is no foreign material, like liquid, on the surface. 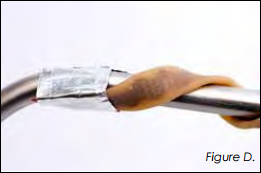 Foreign material inhibits heat transfer and liquid can damage select models of heating tape (i.e. HighTemperature Heating Tapes). Make a visual inspection of heating tape: We recommend that you replace the heating tape if it becomes torn or damaged. 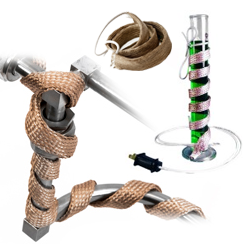 Damaged heating tape is a safety hazard and will not operate correctly. Heating tape can be installed on nearly any surface due to its flexibility. Spiral wrap the heating tape onto the surface to be heated so that the length of one entire side of the heating tape is in full contact with the surface (Figure B). 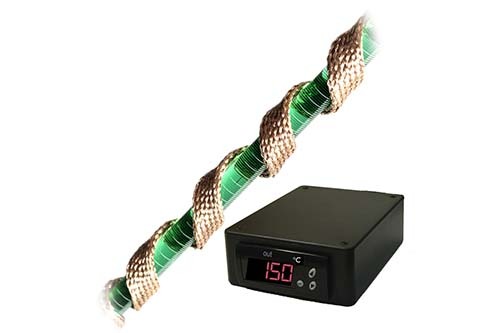 The distance between spiral wraps is dependent on the uniformity requirements and the amount of available heating tape. 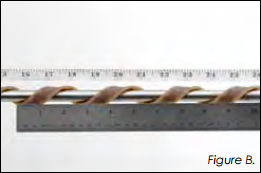 A minimum distance of 1/8” is required between spiral wraps to avoid damage to the heating tape. 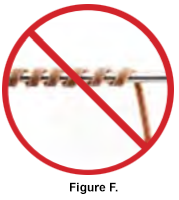 Attach the heating tape to the surface by either using built-in tie straps [select models](Figure C), high-temperature adhesive tape (Figure D), or mechanical clamping devices that will not cause damage to the heating tape. 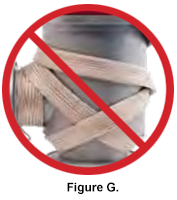 Do not overlap heating tape on itself (Figure G). This can cause damage to the heating tape due to overheating. 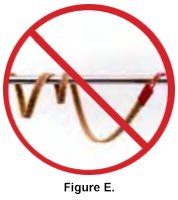 Your heating tape must be connected to an external temperature control device (Figure H). Ensure your temperature controller is protected by a properly sized circuit breaker or fuse. Use of a ground fault circuit interrupter is highly recommended and may be required for your installation. 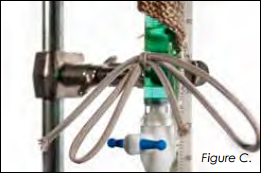 For proper temperature control, secure a thermocouple, RTD, or other sensing device with one strip of adhesive tape so that it is in close proximity to the heater to prevent overheating. Make sure you have selected the correct heating tape for your application. 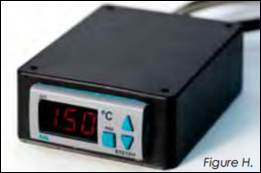 BriskHeat offers a wide range of sizes, voltages, and temperature ranges. Visually check your heating tape prior to use. Make sure that the heating tape makes full contact with the surface to be heated. Always follow the manufacturer’s instructions while installing or removing heating tape. Do not install heating tape on top of insulation near flammable materials, submerged in liquids, or if cut in any way.